The 38th Infantry Division was first constituted in July 1917 as Headquarters, 38th Division in the National Guard and organized with Soldiers from Indiana, Kentucky, and West Virginia at Camp Shelby, Mississippi. 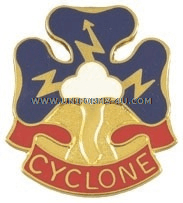 During training prior to deployment to Europe to fight in World War II, a tornado struck the camp in the spring of 1918, thus spawning the Division’s nickname of “Cyclone.” Although the unit did arrive in Europe before the German surrender, its various subordinate units were parceled out to provide reinforcements for other units, which is why the 38th’s World War I Campaign Streamer has no inscription of a specific campaign. Today, the division is headquartered in Indianapolis and contains Soldiers from several states including Ohio, Kentucky, Indiana, Delaware, Michigan, and Tennessee West Virginia.